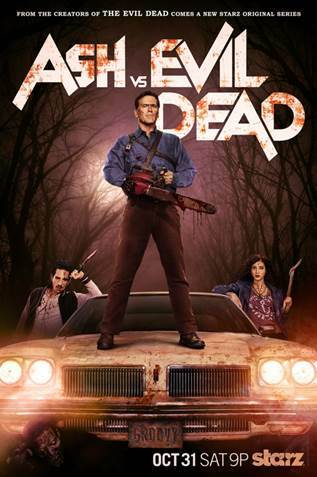 The cast is led by Bruce Campbell (Evil Dead, “Burn Notice”) in the role of Ash Williams, Lucy Lawless (“Salem,” “Spartacus,” “Xena”) as Ruby, a mysterious figure who believes Ash is the cause of the Evil outbreaks, Ray Santiago (“Touch,” Meet the Fockers) as Pablo Simon Bolivar, an idealistic immigrant who becomes Ash’s loyal sidekick, Dana DeLorenzo (A Very Harold & Kumar 3D Christmas) as Kelly Maxwell, a moody wild child trying to outrun her past, and Jill Marie Jones (“Sleepy Hollow”) as Amanda Fisher, a disgraced Michigan State Trooper set to find our anti-hero Ash and prove his responsibility in the grisly murder of her partner. For all your television news, keep it here on NYCityGuys! Previous Entry Rick and Morty Renewed for Third Season! Next Entry Catch “Frozen Fever” With These New POP! Figures!